CuroCarte is a website that stocks the most stunning handmade decor and crockery pieces (look at those kettle and mugs!). 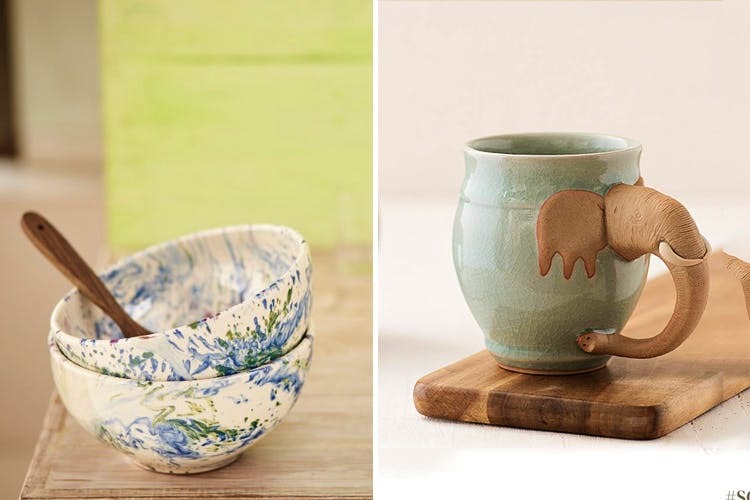 We also love that they employ various crafts like Longpi pottery and Tanjore art in their products—and you can even browse products by specific arts. CuroCarte is a Mumbai-based e-store that creates products using rare crafts like Spanish pottery techniques (the bowls are a piece of art), Channapatna lacquer and more. From paintings and lamps to vases and baskets, this website’s got everything; but it’s their crockery that has our heart. For instance, their Longpi pottery wine set with black goblets and a kettle (all made of stone) looks unusually cool, and also takes care of the maintenance bit (bye-bye delicate wine glasses). We actually love Longi pottery everything (including the doughnut jug, beer mugs and their tea set). You should also check out their variety of rustic Raku bowls, made using a special firing technique. These wouldn't look out of place in a hipster restaurant at all. CuroCarte’s plates, their mugs (OMG look at trunk mugs) and agate coasters could also make for such thoughtful house-warming gifts (doesn't mean you can't get them for yourself too). Their products are a little on the expensive side, but they’ve got a few collections that are reasonably priced too (like the lamps and the Longi pottery crockery). Exploring CuroCarte through its categories like products and through crafts might be the best option, as the website can get a bit overwhelming with its numerous offerings. They deliver across India, and they have a COD option available too.